This Saturday the BC Entertainment Hall of Fame is inducting the first South Asian Artist into the Hall of Fame Starwalk. Canada's leading South Asian online music magazine DESIBUZZbc elaborates on the history of the "Crowned Prince of Bhangra" and how proud the community is of their home grown celebrity. DESIBUZZbc Founder and journalist R. Paul Dhillon And Punjabi Music impresario Bobby Nagra nominated Jazzy B for this great honour. 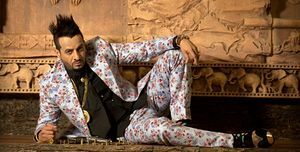 We welcome Jazzy B into the prestigious group of Starwalk Inductees!